AB InBev has barely popped the cap on a $100 billion-plus deal to buy SABMiller. Now the Budweiser brewer is planning its next: a sale of Peroni and Grolsch, two brands it will acquire by taking over the UK brewer. SAB’s dregs might attract a rival, but a private buyer may find the brew more to its taste. Though SABMiller is huge, its brands mostly aren’t. Peroni is big in Italy, and almost nowhere else. Grolsch has some scale in the Netherlands, but no more than 1 percent market share by volume in any other market, according to Susquehanna Financial. Both are under pressure from craft beers. They may worry antitrust regulators, but they don’t really worry SAB’s bottom line. Rivals will no doubt sniff around, but Peroni and Grolsch aren’t a straightforward mouthful. Carlsberg could dilute its troublesome exposure to Russia, but also its more helpful presence in Asia. Japan’s Asahi could decrease its reliance on the shrinking Japanese market – but emerge with tiny footholds in more than 70 markets. That’s not to be ruled out, but nor is it particularly logical. A buyout house – or a family-backed investor – might fare better. Peroni and Grolsch produce around 8 million hectolitres of brew per year, around 13 percent of SAB’s total European volumes. Assume – roughly – that their share of European EBITDA is proportionate, and that leaves a buyer with a little over $100 million a year. Valued on a 12 times multiple, in line with SAB’s disposal of its stake in MillerCoors in November, it suggests the two could fetch $1.2 billion. Thereafter, it’s a question of generating cash and paying back debt. Were a buyer to fund Peroni and Grolsch half in debt, at an interest rate of 5 percent, and grow EBITDA by 3 percent a year for five years, an acquisition could generate an ample 15 percent internal rate of return, according to a Breakingviews calculation. A financial buyer might also be able to offer AB InBev something extra. When it sold Korea’s Oriental Brewery to KKR in 2009, AB InBev won an option to buy it back after a few years on pre-set terms, which it exercised. By replicating that kind of arrangement, the Bud brewer could turn a smart deal today into another one later. 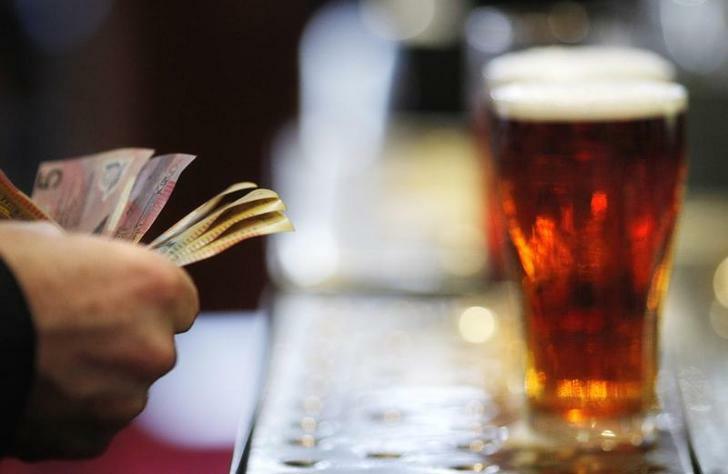 A customer pays for a beer at the Occidental Hotel in central Sydney. Anheuser-Busch InBev is considering a sale of SABMiller’s European business after it agreed to buy the UK brewer for over $100 billion in November. AB InBev said on Dec. 3 that the Peroni and Grolsch brands in Italy, the Netherlands and the United Kingdom may be included, as well as craft beer brand Meantime, which SAB acquired in June 2015 for an undisclosed price. Japan’s Asahi and Spain’s Mahou-San Miguel Group are among those interested, along with private equity groups KKR and Cinven, according to Bloomberg, citing people familiar with the matter.